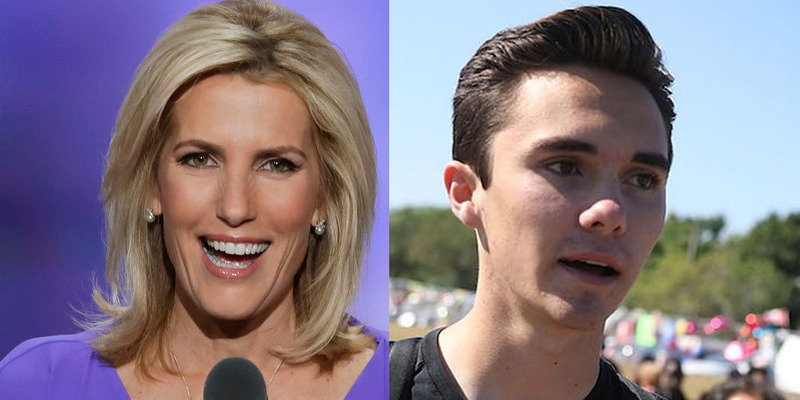 AP Photo/Getty ImagesA combination photo of Fox News host Laura Ingraham and Parkland school shooting survivor David Hogg. Laura Ingraham, the hard-right Fox News primetime host, has made headlines recently for insulting some of the country’s most popular figures on the basis of their liberal politics. Over the last several weeks, the controversial conservative has waded into debates on racism and gun violence, sparking overwhelming backlash. This week, she was forced to apologise to a 17-year-old survivor of the school shooting in Parkland, Florida after she mocked him for being rejected admission to four colleges. The Marjory Stoneman Douglas High School senior, David Hogg, has become one of the most outspoken advocates against gun violence in the wake of the massacre that killed 17. His calls for stricter gun control measures have made him a frequent target of conservative pundits and conspiracy theorists. The public outcry following Ingraham’s attack pushed multiple corporate advertisers to terminate their relationships with the host’s Fox program. Ingraham responded to the controversy by insisting that she tells all kinds of celebrities, including musicians and actors, to “shut up” and do their job. But Ingraham, a strong supporter of the president, does not acknowledge that Trump himself built his political career off of his celebrity. The former reality TV star would regularly call into Fox News shows to express his political opinions on the news topic of the day, despite not having any professional experience in politics.